a 110 inch tall clear statue.the camera light is red.ambient light is antique white..sky is gray.ground is clear..six red lights are -30 inch above the statue.the statue is 10 inch wide [hal]. A 50 inch tall baby is 280 inch left of statue. The baby is facing right. A 80 inch tall female child is 80 inch left of statue. A 40 inch tall egg is 60 inch left of baby. a 100 inch tall clear statue.the camera light is red.ambient light is antique white..sky is gray.ground is clear..six red lights are -30 inch above the statue.the statue is 10 inch wide [hal]. A 50 inch tall baby is 240 inch left of statue. The baby is facing right. A 80 inch tall female child is 80 inch left of statue. A 40 inch tall egg is 40 inch left of baby. The ground is mud. The gold car is -1.4 feet above the Silver car. The gold car is facing right. The ground is shiny. 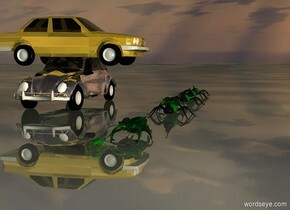 There are 10 very huge green beetles 6 feet to the right of the silver car. It is dawn.